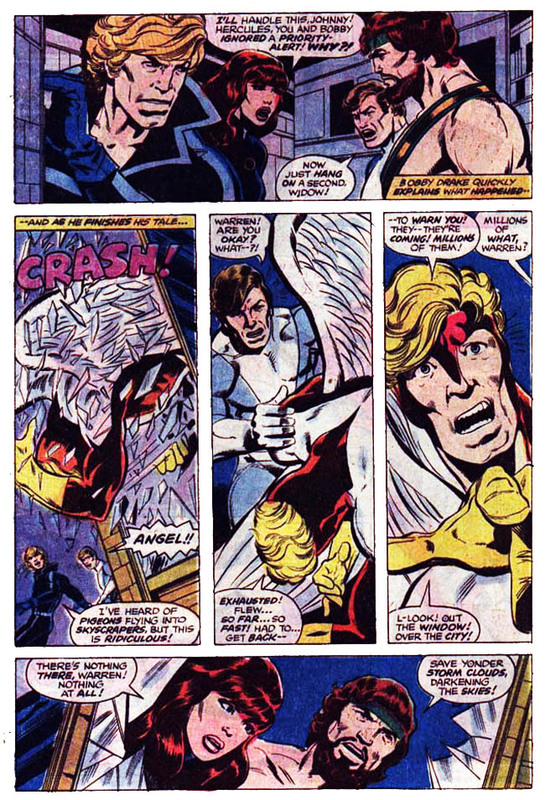 Previously, in Champions: Warren Worthington, the Avenging Angel, left the ranks of the X-Men when all the weirdo mutants started showing up (especially that stinky Canadian fellow.) 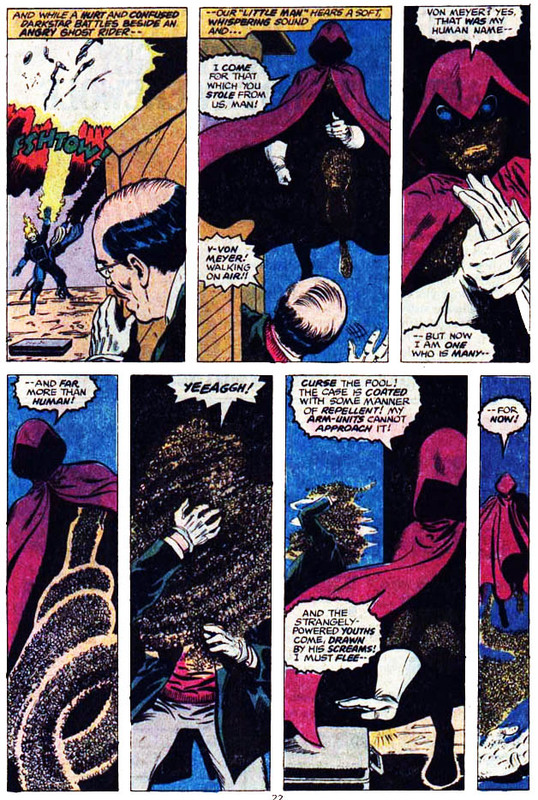 After a chance encounter, he used his family fortune to help bankroll a superhero team on the American West Coast, calling in his best friend Iceman, and conscripting The Black Widow, Hercules and the Ghost Rider into the ranks of what became known as The Champions. 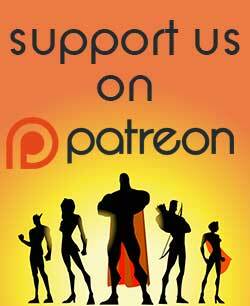 With the assistance of associate member Black Goliath, they have even built and outfitted a state-of-the-art quarters to better face down the superhuman menaces that Los Angeles has to offer. 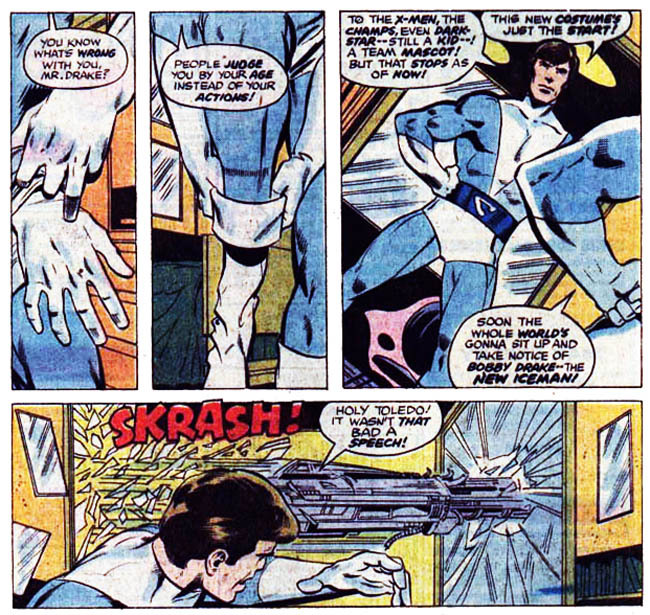 Of course, as the Lion of Olympus finds out the hard way, that equipment may be a bigger threat than any villain, as the security system of Champions headquarters turns on HIM! 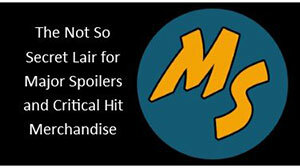 If you’ve ever read Bronze Age comics, you know that the remaining companies (Marvel especially) hit a bit of a creative doldrums in the mid-70s. While a lot of truly brilliant stuff was getting written in this timeframe, paper shortages, inflation and a general defection of talent left books like Champions to flap in the breeze. The team would break up a few issues later, with nothing more than a general consensus of “This was always a bad idea anyway” to justify it. 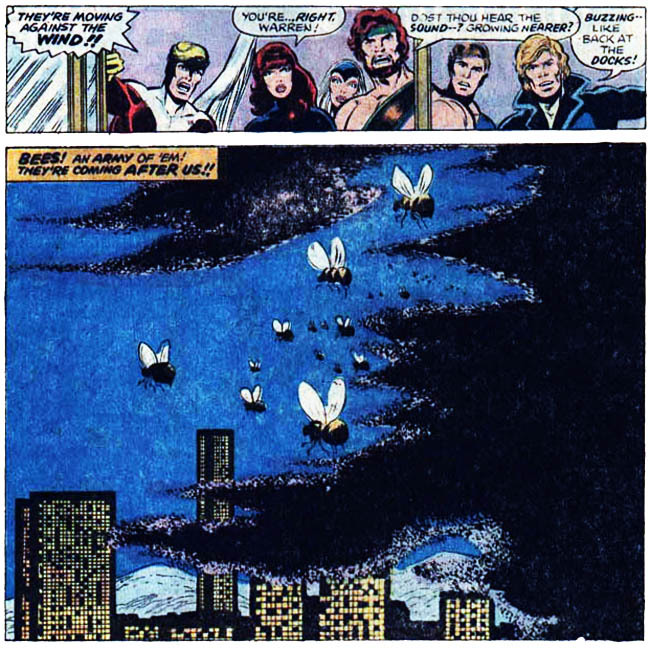 Angel and Iceman found more success with the Defenders soon after, and eventually returned to the X-Men ranks, while Hercules and Black Widow drifted back to the Avengers, and Ghost Rider rode off into the sunset for good in ’81 (a story which I’ll have to get to, soon enough.) 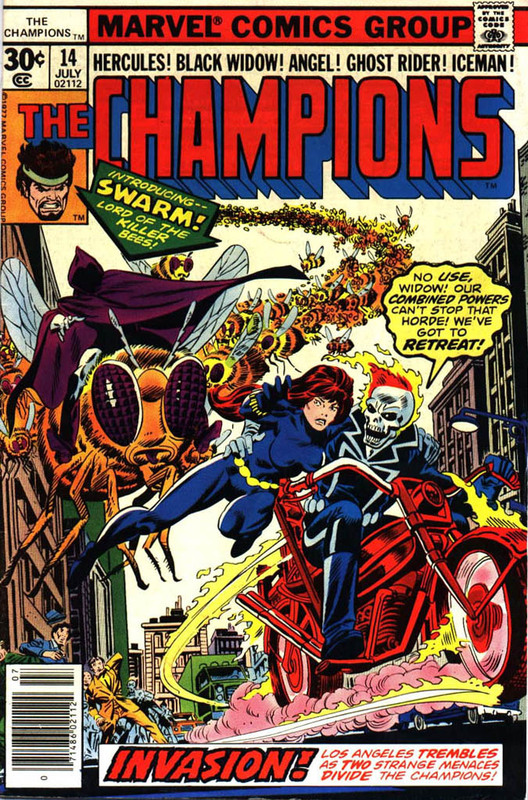 Even some interesting work from a young John Byrne and Mantlo’s usual flair can’t pull this issue out of it’s Studio 54 doldrums, and the real origin of Swarm (here’s a hint: Nazi skeleton + radioactive bees) isn’t told until the NEXT issue, leaving The Champions #14 as a somewhat underwhelming 2 out of 5 stars overall. All the pieces of greatness were here, but somehow it never gelled into the brilliant book that it should have, which can be seen as a metaphor for the 1970s as well. 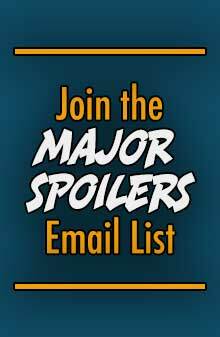 Keep on truckin’, Faithful Spoilerites. “All the pieces of greatness were here, but somehow it never gelled into the brilliant book that it should have, which can be seen as a metaphor for the 1970’s as well.” – Kudos Mathew, very nice line. I loved “The Champions”… but, what an odd combination of characters. 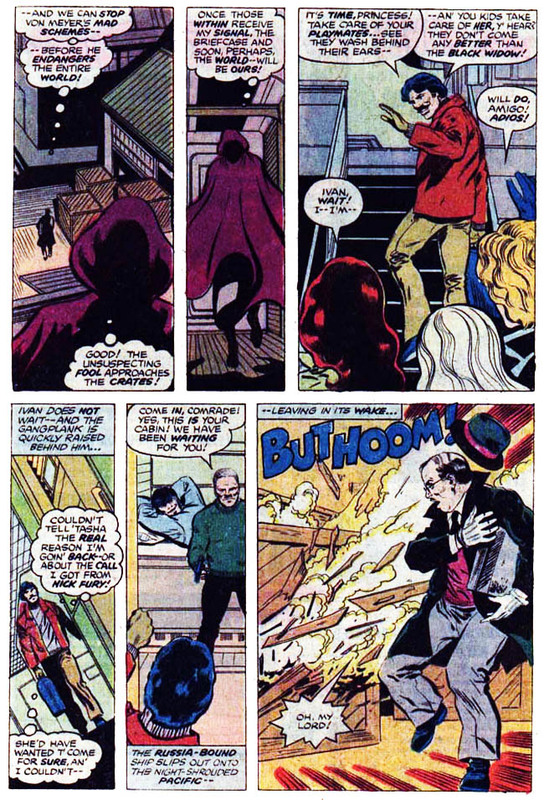 Byrne was awesome and they had a ton of “guest stars”… but, it just never found an audience. And, in those days SALES was all that counted. Byrne’s Hercules and Black Widow rivaled John Buscema’s work! 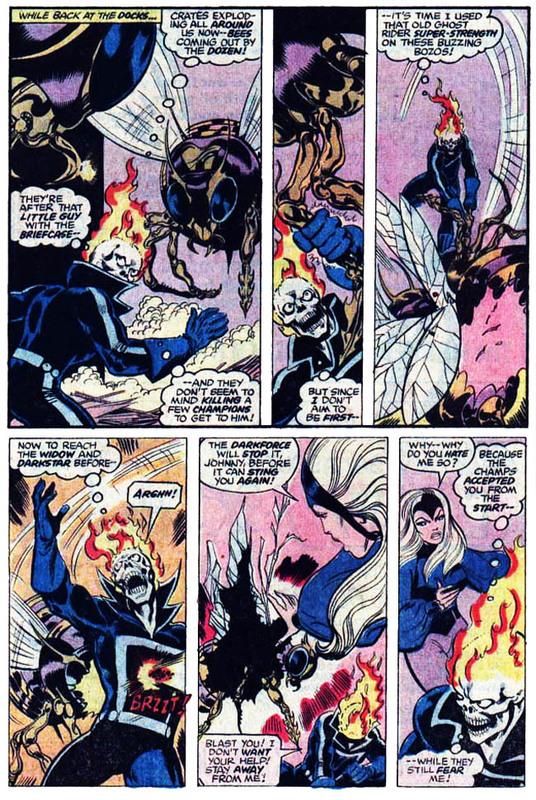 The only one he never got a handle on (for my tastes, anyway) was Ghost Rider… Still, the Champions was offbeat fun while it lasted.